Because I am now own The Beatles in Mono box set. Now, to be fair, I never said I didn’t want to buy the Beatles remasters. Far from it. My sticking point was the $300 price tag for the mono box set, and the near-$20 price point for the individual albums. However, recently — with the help of some coupons and the like — I was able to get 60% off the list price of The Beatles in Mono, so that the final price came out to just over $140 (with tax included). On top of that, retailers like Great Buy Best Buy have the individual Beatles albums for $14, so I also picked up copies of Abbey Road, Let It Be and Past Masters for around $50 (as those albums have songs on them that were never mixed into mono, so they aren’t part of the mono box set). 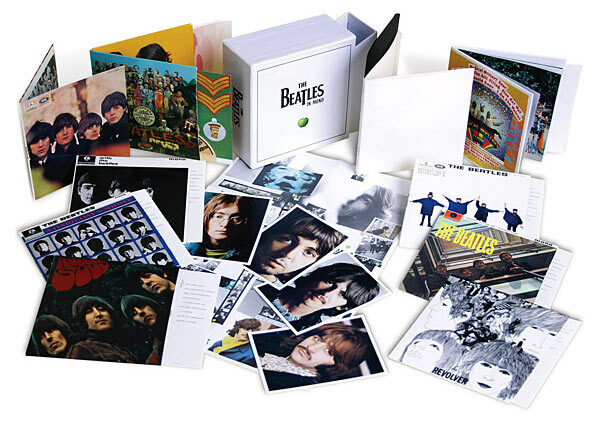 All told, I spent just under $200 for all of the remastered Beatles album (bar Yellow Submarine, which I’ll get to in a sec), which is still $60 or so less than buying the box set containing all the albums in stereo. Pricing aside, I really like the box set. A lot. Each of the mono albums comes in a replica LP sleeve, including a replica paper inner sleeve (including the groovy swirly pink inner sleeve that came packaged in Sgt. Pepper’s Lonely Hearts Club Band; the Sgt. Pepper Cut-Outs are even included!). The CDs themselves come in a plastic CD sleeve (yes, in addition to the inner paper sleeves) and the replica album covers are exact in their reproduction, right down to the ads for EMITEX Record Cleaner on the back covers. On top of that, each album comes packaged in a resealable plastic bag to protect it from wear and tear, and are collectively housed in a single box for further protection. 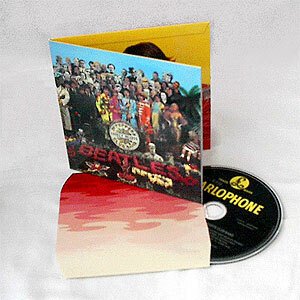 Additionally, each CD label replicates the original LP label of each album — thus, most of the CDs have a Parlophone or Apple Records label…except for the (originally U.S.-only) Magical Mystery Tour album, which dutifully gets a Capitol Records logo (I love when the little details like that are reproduced). Yellow Submarine was also available in mono when it was first released in 1969, but it wasn’t a true mono mix — the stereo mixes were folded down into one channel — so it is not included in the set. However, the four “new” songs from that LP (“Only a Northern Song,” “All Together Now,” “Hey Bulldog” and “It’s All Too Much”) were mixed into mono for inclusion on a planned EP in 1969, and those mono mixes are now available on the Mono Masters disc for the first time ever. So unless you’re a completionist or really like George Martin’s instrumental tracks from the album, you don’t really need Yellow Submarine if you buy this box set. 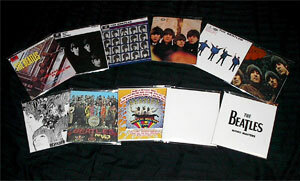 You will need to get Abbey Road, Let It Be and Past Masters though, if you want the full set of Beatles recordings. The Mono Masters two-disc set is the box set’s equivalent to the Past Masters set, with a couple of key differences. First off is the inclusion of the Yellow Submarine tracks I listed above. Second, Mono Masters excludes the songs “The Ballad of John and Yoko,” “Old Brown Shoe” and “Let It Be” because those songs were never mixed into mono (which is why you need Past Masters). So, after all that, is it a worthwhile compilation? Well, yes and no. Yes because everything the Beatles recorded up through 1967 was mixed almost exclusively with mono in mind — stereo was often an afterthought in those days, and very little care was given to stereo mixing (this led to some amusing instances like “She’s Leaving Home,” from Sgt. 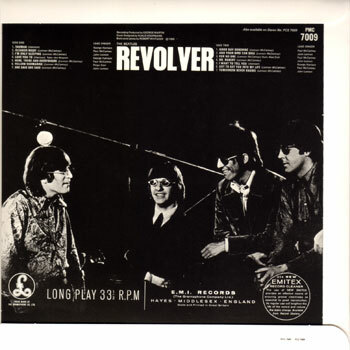 Pepper, where the stereo version is a full ten seconds longer than the mono version because the stereo master was not sped up like the mono one). Even once the Beatles starting paying more attention to stereo recording, there can still be key differences between mono and stereo mixes (“Don’t Pass Me By,” like “She’s Leaving Home,” was sped up in mono, while Helter Skelter in mono is nearly a full minute shorter than the stereo mix, because it doesn’t fade back in after the first fadeout like in stereo — which also means the mono mix doesn’t include Ringo’s famous “I’ve got blisters on my fingers!” shout at the end of the song). Also, sometimes the stereo mixes from the early years include mistakes — like Paul’s voice cracking on If I Fell, or John screwing up the lyrics in the last verse of Please Please Me — that are not present in the mono versions. Odd occasions like that aside, though, there isn’t that much of a gulf between stereo and mono, despite what some hard-core fans and audiophiles will assert. Certainly, a casual or non-obsessive fan would be better served just grabbing the regular editions of the remasters, or even sticking to their old 1987-vintage releases. The sound on the new remasters is improved — a bit louder, and some spots where there were sound dropouts on the old CDs have been fixed. But you still get some of the extreme stereo panning from the old releases (vocals isolated on one channel, etc.) — and heck, the first four Beatles albums were released in mono to begin with back in ’87. Ironically enough, in the post I linked to in the opening paragraph, I felt sorry for the hypothetical Beatles fan who had to have the CD box sets and The Beatles: Rock Band on the day of release, just for the sheer amount of money it would cost. Well, it took me a year, but I now own The Beatles: Rock Band (and all DLC released for it) and now The Beatles in Mono (plus the albums not in said set). However, I spent just under $140 on The Beatles: Rock Band (compared to a MSRP of $250) and $200 combined on my new Beatles CDs (compared to a $260-300 MSRP of the discs, depending on stereo or mono). And I also didn’t buy everything at once, which didn’t put as big of a bite on my wallet as it would have had I run out to the stores to get everything at once on 9/9/09. I guess there’s something to be said about learning the language of the deal. Oddball Verdict: REALLY nice, but still not worth $300.